Greece: history, fun, countryside, Athens, cuisine, new friends, islands, music, the Plaka, naps, ferries, sculpture, philosophy, swimming, Greeks, architecture — memories that we will treasure for a lifetime. 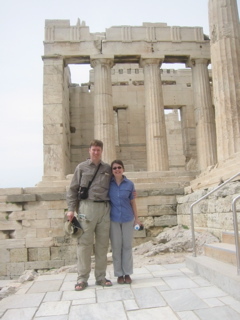 We traveled to Greece in May, 2004 on our third Rick Steves' Europe Through the Back Door trip. On the left, you see us at the Acropolis in Athens (known locally, and beautifully, as "Athena"). Why travel? To experience the slowing pace of the day, when you taste every morsel and feel the sun on your cheek. Why travel to Greece? For the history, where something as simple as an olive tree tells a story of love, war, passion and death. For the people, including an octogenarian we met with whom we had a wonderful, gesticulating conversation, despite the language barrier, and who surprised us with flowers cut from her own garden. For the language lessons, courtesy of our erudite Scottish guide who lives in Alexandria, Egypt — "Alex," as he calls it. For the food, which was delicious everywhere, from Eden restaurant in Athens to a taverna in Gythio. And because we love the Olympics, and wanted to see their birthplace in Olympia before they returned to Athens. Please join us for a taste of Greece. We invite you to share a few of our favorite photos from our travels through Greece.